Join Planet Way Round in this extreme tour exploring Zanskar and Ladakh lakes. This tour is founded on Planet Way Round’s 15 years of experience with motorcycle expeditions in Ladakh. You can expect new tracks, passes, and highlights never before offered on an organized motorcycle tour. This is the first tour to take on Zanskar and extremely high Himalayan passes. Feel the thrilling experiences as you ride along with your bike! Planet Way Round offers domestic and international bike and Jeep tour packages that can be customized according to your wishes. Feel free to take a look and see what catches your fancy. Four-wheel drives can take you places other vehicles cannot. Planet Way Round also knows that sometimes adventure seekers come in groups and want to travel as one. The 4×4 jeep tours help you, your family and your friends enjoy the trip together! Does the ordinary bore you to the core? Let Planet Way Round redefines adventure for you. The highly customizable trips will change the way you tell your trip stories. Goosebumps and exhilaration, guaranteed! Four wheels move the body, but two wheels move the soul! As the core area of expertise, Planet Way Round offers you bike trips to locations you have only read about until now. Take the adventure to the next level as we take you on a bike trip to exciting and amazing destinations in India and abroad. Your accommodations for this motorcycle tour is good rooms on two sharing basis in 3-star hotels, guesthouses, and tents. This is a challenging tour. Solid riding skills, a sense of adventure, and flexibility are a must when taking part in the Himalayan expeditions, which cover around 2,000 kilometers and considerable altitude differences. Road conditions vary from freshly paved to rough tracks. This tour is a mystical “river journey” to wild Zanskar valley, hidden in the remotest reaches of the Himalayas. After crossing rocky valleys and passes to the mouth of the Suru River near Kargil, there is the gateway to Zanskar valley. The route takes you up the wild, rugged valley on a steady climb to Pansi La pass (4,400 meters), the only road into Zanskar. You’ll be passing enormous glaciers on your way into the valley. You’ll slowly work your way up the rough tracks to your destination in Padum. After exploring Zanskar, get to know the highlights of the Indus Valley. Last but not least, enjoy the ultimate high point, one that can also be measured in terms of altitude, the Khardung La, the highest pass in the world at 5,605 meters. This is the first tour to take on 14 extremely high Himalayan passes. You’ll be hitting altitudes of over 5,000 meters five times and tackling the two highest passes in the world. The route covers all of the highlights of the ancient Buddhist Kingdom of Ladakh as well as the three most beautiful Himalayan lakes in the border region to Tibet, all at altitudes of more than 4,500 meters. You’ll spend 15 days on the road in Ladakh. Arrive in Leh and stay in a hotel with acclimatization. At the start of the tour, you will enjoy the beautiful green valley and drive with Indus river cross Moon landscape, Lamayuru (Oldest Monastery in Ladakh) and Giant Maitreya at Mulbekh. Then, descend into Baltistan valley to the garrison city of Kargil, the gateway to Zanskar valley. A hotel at the top of town (2,600 meters) will be your home for the night. You will drive for Rangdum through the beautiful, wild Suru valley. You’ll be leaving paved roads behind today, continuing on a dusty track at average speeds of around 20 - 40 kilometers per hour, ascending to the herdsman’s village of Parkachik, and reaching Rangdum. Starting from Rangdum in the morning, today, you’ll ascend the adventurous track further until you reach Pansi La pass (4,401 meters) and visit the tiny Rangdum mountain monastery before descending along a huge glacier at the entrance to Zanskar valley and reaching Padum valley. Today will be no ride. You will visit area surrounding the Padum, the only small town in Zanskar. Only around 1,000 people live here in the summer. In the afternoon, you’ll visit the Karsha Monastery, a medieval oasis of peace and an important center of the Buddhist faith. You’ll be spending the night in the best guest house in Zanskar, at an altitude of approximately 3,500. Your return trip will start with a longer ride. You’ll be crossing Pansi La pass (4,401 meters) and spending another night on a meadow near Parkachik Glacier. Descending through Suru valley to Kargil, you’ll come across your first filling station in 550 kilometers. Crossing the Fotu La pass, you’ll reach the Lamayuru Monastery and set up your tent there at an altitude of around 3,800 meters. You’ll have the opportunity to witness the morning meditation in the monastery, an unforgettable experience. Next, you will go to a steep descent to the Indus Valley. Your next track starts at the confluence of the Indus and Zanskar Rivers. The 40 kilometers along the wild Zanskar River to Chilling, a village of coppersmiths, is one of the most breathtaking motorcycle routes anywhere in the Himalayas. You’ll be reaching Leh, the end of your motorcycle tour, in the late afternoon. You will go for 50 kilometers on the road and 2,000 meters ascent to Khardung La pass, the highest motorable road in the world. After a brief stop in the thin mountain air for a photo, you’ll descend quickly into the arid Nubra Valley, which until recently was a restricted military zone due to the nearby Pakistani and Chinese borders. It’s now a new high point of your Ladakh tours, with breathtaking views, remote oasis villages, and rugged river landscapes. You will have a half-day ride through the broad valley to the hot springs of Panamik, followed by afternoon riding on camels through the sand dunes of Hunder. Dinner is once again in the peaceful garden of your guest house. It’s the summit! It’s time for the world’s highest motorable road, the Khardung La pass (18,380 feet). Later, you’ll return to your headquarters in Leh. The afternoon is free to relax, shop, or visit the Shanti Stupa at sunset. Dinner will be at the best Tibetan place. Post breakfast, you will ride along with Indus rider till Mahe Bridge then Tso Moriri Lake. The lake is located at 14,000 feet near a small village of Korzok. On the way, you will cross Polokangla and Namchick La passes before you reach Korzok village. Upon arrival, you will check in at your camp. Post breakfast, you will check out and drive to Tso Kar Lake. You will cross the biggest and highest plateau on earth on a stretch of 42 kilometers, then you will reach Skyangchu Thang (the biggest and highest plateau on earth on a stretch of 42 kilometers), Tanglang La pass (17,585 feet), and Indus Valley. Upon arrival in Leh, check in at a hotel. It’s time to fly back home. With an interesting story behind his peculiar nickname that he loves to narrate when asked, Rahul Chauhan a.k.a MAT is very well-known and respected among the Indian biking fraternity. A doctor by education and a traveler at heart, he lives life as simple village boy. MAT has been riding through the length and breadth of India since the late 90s. His knowledge and experience of traveling in India and Asia is unparalleled. He is also a bit of a grease monkey and loves getting his hands dirty, modifying, and restoring old bikes and cars occasionally. Sheetal is a Civil & Structural Engineer who occasionally feels that she might get stuck in an office in the buildings. Sheetal Baranth a.k.a CHERRY makes and turns into an audacious backpacker and an energetic traveler as soon as she can. She loves traversing non-traded paths and loves interacting with people. She is the scribe and the motivator of the team. Cherry also takes yoga classes in a tour. Cherry has traveled extensively pan India and has led many camping and photography tours in North and Central India. This tour will take you from Srinagar to Leh. Along the way, you will visit Kargil, Rangdum, Padum, Parkachik, Lamayuru, Nubra Valley, Tsunder, and Tso Moriri Lake. This tour will also take you to some amazing passes and lakes. Extra meals, starters (alcoholic, mineral, soft drinks, aerated, Pay N Eat) etc. Please book your flight to arrive at Indira Gandhi International Airport (DEL) or Kushok Bakula Rimpochee Airport (IXL). Transfer from and to the airport is included. Planet Way Round will pick you up from the airport. Airport: Kushok Bakula Rimpochee Airport Airport transfer included: Kushok Bakula Rimpochee Airport No additional charges. You can request this in the next step. Planet Way Round offers motorcycle tours to the Himalayas. 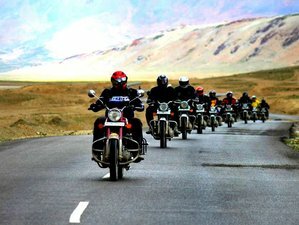 Their mission is to provide you a fabulous experience of ridding at Zanskar,Ladakh,Bhutan,Spiti etc. The rates below are applied to people outside of India. This tour requires minimum 4 participants to run.